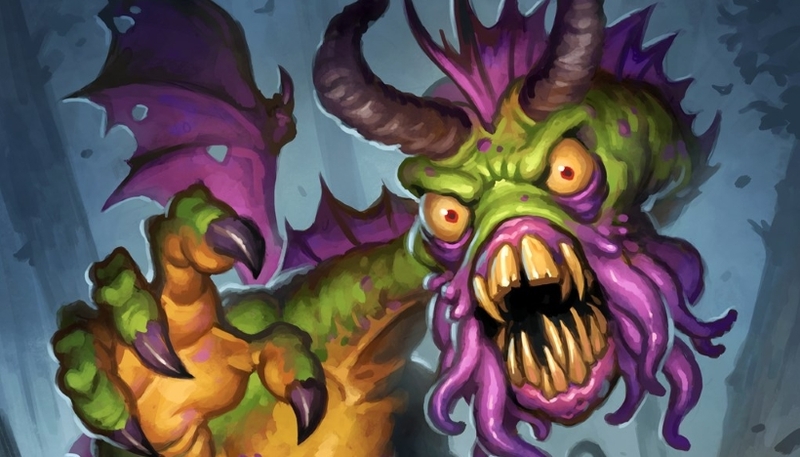 Our Shudderwock Shaman deck list guide features the best Rise of Shadows deck list for Season 61 of Hearthstone (April 2019). Our Shudderwock Shaman guide also contains Mulligan advice, card combos and strategy tips. Shudderwock Shaman was a new Hearthstone archetype to arrive with the Witchwood expansion, and relies on the titular Legendary card to provide a supremely powerful late-game presence. Once played, Shudderwock will re-cast every Battlecry you triggered earlier on in the match on random targets. If he / it's the only character on the board though, it'll benefit from all of those effects directly. For the purposes of our latest take on Shudderwock Shaman, we're highlighting a classic version of the deck that’s remained strong in the early weeks of the Rastakhan’s Rumble meta. None of the new cards have changed all that much for the archetype! We've also got tips on completing the Mulligan stage, a detailed section on playing the deck, and a look at all the impressive combos this exact list contains. Here’s a deck list for Shudderwock Shaman that’s seeing marginal play rigth now, and is subject to a lot of change in the coming days and weeks. Everything below this point refers to an earlier version of Shudderwock Shaman and will be updated once the launch window is behind us. Even after the release of the new Rastakhan cards, this classic version of Shudderwock Shaman is proving the most competitive for the Hearthstone ladder right now. We'll keep an eye on it in case anything changes, though. You’re probably already well aware of how the old Shudderwock Shaman worked: a meticulous set of Battlecry effects executed one after the other to kill your opponent in the longest, most demoralising fashion possible. What fun! New Shudderwock Shaman isn’t quite as obnoxious as the combo version, instead going for more of a tempo spin that aims for board control, and overwhelms your foes with multiple powerful copies of Shudderwock. Some of the big Battlecry effects in the deck that make this work are Prince Keleseth, Electra Stormsurge, Zola the Gorgon, Lifedrinker and Saronite Chain Gang to set up a menacing line of Shudderwock minions. There’s also a heavy helping of late-game survival afforded by Hagatha the Witch. Early game: You’ll want to fight for the board from the off, so try to get yourself established with your early drops like Glacial Shard and Acolyte of Pain, or make an especially powerful start with Prince Keleseth to buff the rest of your deck’s minions. You can also catch up with a Mind Control Tech should they go wide enough on the board. Mid game: With board control established you’ll want to start building your Battlecry pool during the mid-game. Saronite Chain Gang, Lifedrinker, Zola the Gorgon and Grumble, Worldshaker all fit in perfectly during this stage of the game to make your side of the board even more threatening. Late game: Now’s the last chance to fit in any final Battlecry effects you’d like to see added to the list for Shudderwock. When you do eventually drop Shudderwock it’ll put huge pressure on your opponent by filling the board with multiple buffed copies that they likely won’t be able to handle all at once. 1. Don’t be afraid to keep Lightning Storm in your opening hand when you sense aggro, so you can prevent them from running away with the game. Electra Stormsurge pairs especially well with the spell. 2. If you do fall behind early, the deck does have a few catch up mechanics in the mid and late-game, courtesy of Volcano and Hagatha the Witch. 3. If you have Prince Keleseth early on in your opening hand you’re already at a huge advantage and can make much better trades with your opponent’s cheap minions. 1.You should have more time to develop your Battlecry pool against slower control players, so don’t worry if some vital pieces are lying deeper in your deck. 2. Many control decks love running weapons, so Gluttonous Ooze can cause some serious disruption to their game plan if timed well. 3. It may be tempting to pull the trigger on Shudderwock as soon as you hit turn nine, but consider if your opponent may have a big board clear to hand like Psychic Scream or Vanish that could negate its impact entirely. 4. A card like Mind Control Tech has much less of a chance going off versus control, so consider playing it as a 3/3 body to increase your early game pressure. Here are some of the cards you’ll want to keep an eye out for in your opening Mulligan to get the match off to a great start. 1. Prince Keleseth: If you see Prince Keleseth, you keep Prince Keleseth. It’s a buff to every minion in your deck! Simple as that. 2. Mana Tide Totem: This will likely force your opponent into inefficient removal plays, slowing them down a little in the process. 3. Acolyte of Pain: If you can get a couple of draws off the Acolyte then that's perfectly good value to aim for. - We'll start with the big one: Shudderwock. When you play this card, all previously played Battlecry effects will be cast once again on random targets. - All minions remaining in your deck gain an extra +1 / +1 of stats when you put Prince Keleseth onto the board. - The card you draw via Far Sight will have its Mana cost reduced by three. - If the opponent has four or more minions on their side of the board, Mind Control Tech will pick one at random and swing it over to your side of the playable area. - The spell you cast immediately after playing Electra Stormsurge - and on the same turn - will actually go off twice. Consider the clearance power of cards like Lightning Storm in this context. - Keep in mind that you can sometimes work the board to leave yourself with some kind of board presence before casting Volcano. The odds won't always go in your favour, but see if there's a way of setting up a potentially preferential position for yourself. - Keep in mind that these bonus Shudderwock Battlecries are triggered in a completely random order. You don't need to track what you've played and when, which at least takes some of the complexity out of playing this deck. - Gluttonous Ooze doesn't just destroy your opponent's weapon, it also grants you Armor equal to that weapon's Attack value at the time it was destroyed. - Hagatha the Witch provides you with a new hero power that rewards you with a random Shaman spell each time you actively play a minion onto the board. She also inflicts three damage against friendly and enemy minions when cast. Shudderwock Shaman is having a pretty good time lately against all of the new Rastakhan’s Rumble deck experiments, so you’ll want to run as close to this original list as possible to have the most success. Prince Keleseth: Hugely impactful if you can get the effect off early and synergises brilliantly with Shudderwock in the late game. An essential element of the deck. Electra Stormsurge: The new Shaman legendary is a fun card to pair with the likes of Lightning Storm against aggro, although with the minimal spells in this list it isn’t absolutely vital. If you are running into a lot of aggro a Volcano is a solid replacement. Gluttonous Ooze: Gets rid of troublesome weapons and gives you a lovely armour boost at the same time. You can run an Acidic Swamp Ooze in its place without too much trouble. Zola the Gorgon: Can add an extra copy of the deck’s strongest cards back into your hand. Saronite Chain Gang: Needed to make duplicate copies of your Shudderwock for when you decide to unleash the combo. Lifedrinker: Can help set up the life total damaging combo that will slowly but surely kill your opponent with this Battlecry effect. Hagatha the Witch: The Battlecry effect on Hagatha the Witch is a particularly strong comeback mechanic.